SkyTruth Drilling Alerts is a repository of natural gas and oil drilling publications from SkyTruth. This includes maps, images, graphics and other information related to the drilling industry. Explore this page to learn more, and to sign up if you'd like to receive drilling alerts automatically via RSS feed or email! SkyTruth publishes a real-time feed of pollution incidents, drilling permits and other drilling related reports in the SkyTruth Alerts system. On this site you can see the latest alerts for Pennsylvania and West Virginia. More states are coming soon. You can also subscribe to automatic email notifications so you will know as soon as a new report is published in your area of interest. SkyTruth applies a predictive model that shows which watersheds are likely to experience drilling activity in the near future, based on past drilling and recent permit activity. We produce maps based on this model with watersheds color-coded by predicted drilling intensity. HotSpot Maps, for example, are used by local citizens groups concerned about the potential impacts of drilling to target areas for water quality measurement and monitoring. 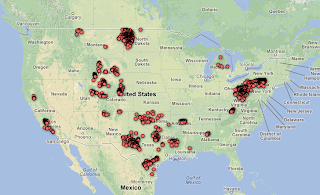 SkyTruth publishes other maps, images and graphics illuminating the patterns and impacts of oil and gas drilling in various places. Examples include Abandoned Oil and Gas Wells throughout Pennsylvania and Drilling Activity in Allegheny National Forest. Monongahela Watershed Drilling Alerts Drilling Alerts for the Monongahela Watershed are now active, and we're updating permits issued daily from the West Virginia and Pennsylvania DEP. You can see individual drilling events by sub-watershed, and sign up for email notifications whenever new drilling activity is reported. More watersheds are planned - send us email and let us know which watersheds you would like to see. West Virginia Drilling Alerts Drilling Alerts for West Virgina were activated on the site last week, and we're updating permits issued daily from the state DEP. We're having trouble getting timely drilling reports however, so stay tuned as we work on that. You can browse frack alerts by county, and subscribe for automatic email updates. Pennsylvania Drilling Alerts Drilling Alerts with automatic email notification are now available for the state of Pennsylvania. View alerts by county, subscribe via RSS or get daily email updates when anything new is posted.